I love hops. 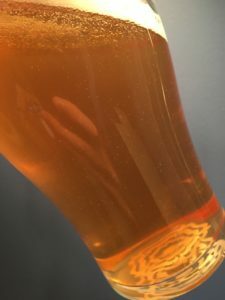 A good hoppy beer is my favourite part of the whole craft beer revolution we’ve been going through over the past few years and so when I came across a recipe for a hoppy American Pale Ale I had to try it out! Will it make me a True Believer? UPDATE: It was pointed out in the comments that I (being an idiot!) forgot to include the link to the source of the recipe when I copied it into this post. All credit for this delicious brew goes to the folks over at Short Finger. Please do check them out – if the rest of their recipes are anything like this one then those guys definitely know what they’re doing! Can we just take a moment and all agree that mashing smells amazing? 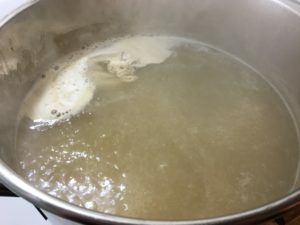 Boil going and hops in! 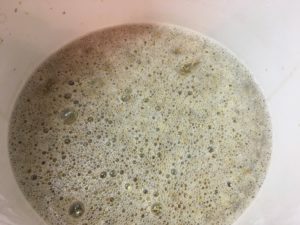 Do muslin hop bags result in cleaner beer? No idea. Do they make cleanup easier later? Sure do! 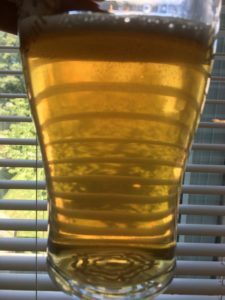 The original gravity reading on this beer came in at 1.042, while the final gravity reading came in at 1.004 for an ABV of 4.99%. A bit lower than what I was aiming for but hey that just means I can enjoy some more without risking a terrible hangover right? Fast forward to the end of bottle conditioning and how does it taste? Well before we get there let me just say that this beer smells absolutely heavenly. The hop aroma off of this thing is killer and on its own is enough to make me want to brew this again. Seriously, it smells that good! The taste is also really superb. It has a great body with perfect mouthfeel and the finish on it leaves you wanting even more. 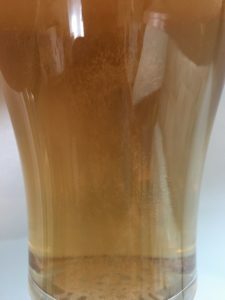 To be honest this is probably the best beer I’ve ever brewed. So if you’re looking for an hoppy, but not too bitter, American Pale Ale then I would highly, highly recommend you try this one out! Nice and clear, even with that much hops and no cold crashing! Hope you enjoyed my recipe. Feel free to actually mention where/who you got a recipe from. So sorry about that! I completely goofed when I was formatting the recipe but I’ve included the source now. Definitely want to give you guys credit for this delicious brew! All good, really not upset. We post our recipes online and have no problem with people using them but appreciate being mentioned/sourced if it is being published in any way.